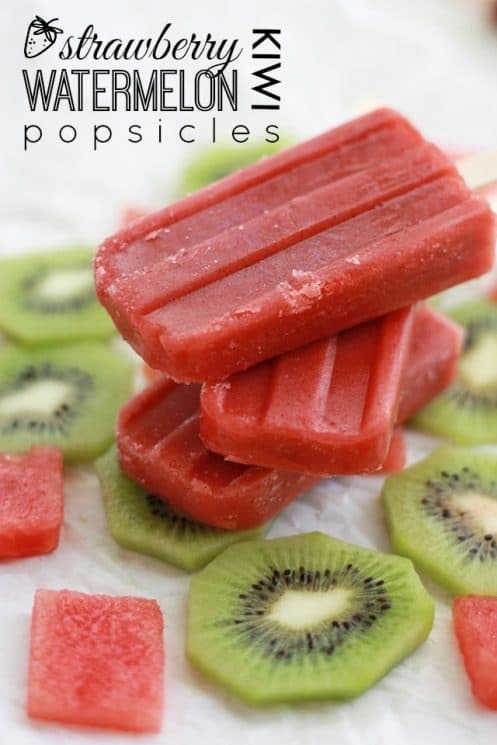 A refreshing, naturally sweet summer treat! Gluten free, vegan, and perfectly delicious. Our little family has been enjoying the sunny days and warmer weather. With school getting out, we’ve got a bit more free time on our hands, and we’ve been using it to spend time playing outside and swimming at the pool. Hot afternoons call for cold summer snacks, and popsicles are our go-to. 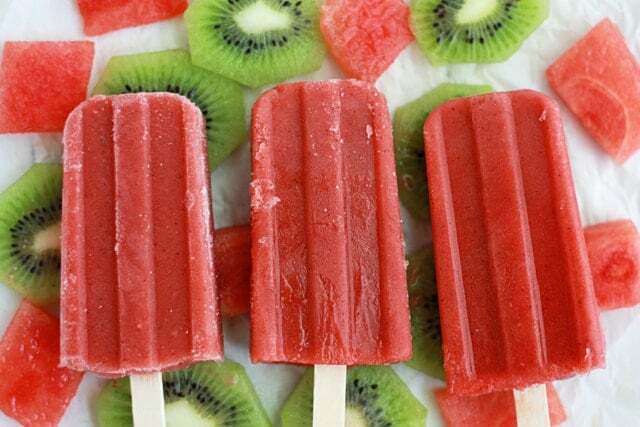 Making smoothies into popsicles is also great because you retain all the fiber found in the whole fruit itself! Kids need fiber daily, preferably more than 14 grams each day. 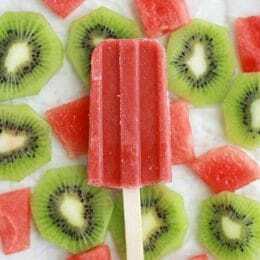 These strawberry watermelon kiwi popsicles are a perfect use for leftover watermelon you have in the fridge and can even rescue a watermelon that was less-than-amazing (we all get those sometimes, right?). The sweetness of the strawberries and the little tart undertone from the lime and kiwi make this the perfect, naturally-sweet treat. As an added bonus, watermelon contains plenty potassium and magnesium, which help restore your body’s electrolyte balance after spending all that time running around or sweating in the sun. To change things up a bit, you can swap out the strawberries for raspberries. I just love the strawberry-watermelon combination so much I can hardly ever stray. Also note that fresh or frozen strawberries work well in this recipe. 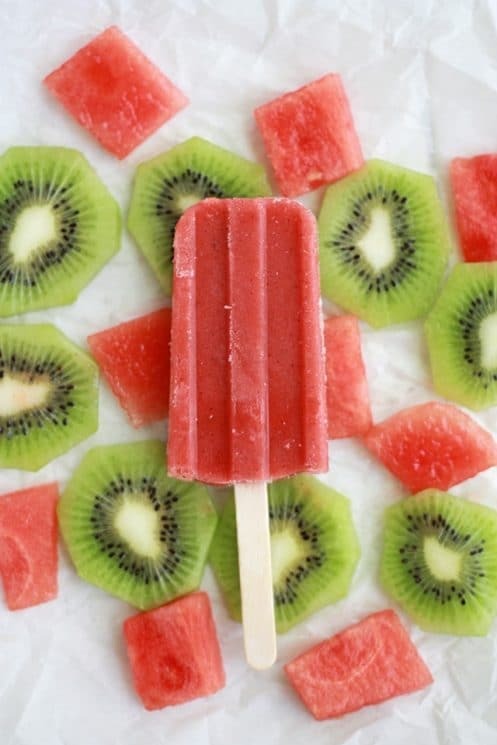 What are your family’s favorite summer treats? Emily eats, reads, lives, and loves over at One Lovely Life, where you can find healthy recipes, happy thoughts, and THE cutest babies. Juice and zest the lime. Peel kiwi. Dice watermelon and hull and slice strawberries. Place all ingredients in a blender and puree until completely smooth. Freeze at least 3-4 hours, or until solid. Do you put the whole lime in the blender, or squeeze the juice? Just the juice and zest of the lime. Sorry for the confusion! The kiwi and lime juice were overwhelming. Neither me or my daughter were much of a fan of these.